Three MDC Signature perfectly matched round brilliant cut diamonds in a thin bezel-set 14 Karat white gold push back setting, dangling from delicate links. The diamonds graduate in size, the top being the smallest to the bottom largest. Top: 0.12 ct., middle 0.17 ct., and bottom 0.20 ct. for a total weight of 1 tcw. It's a perfect match to the Diamonds by the Yard Necklace. Wear them daily or elegantly with your best formal attire. 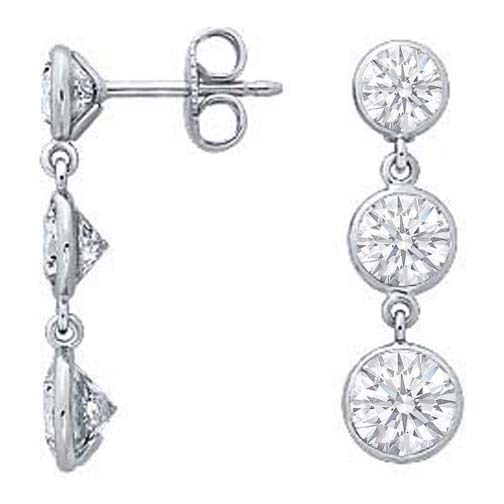 This style is available in many different sizes as well as other shape diamonds. Also available in rose gold, white gold, yellow gold and 950 platinum.